Indian women hold out their hands as they stand in a line to take part in a "women's wall" protest in Kochi in the state of Kerala state on Tuesday, Jan. 1, 2019. 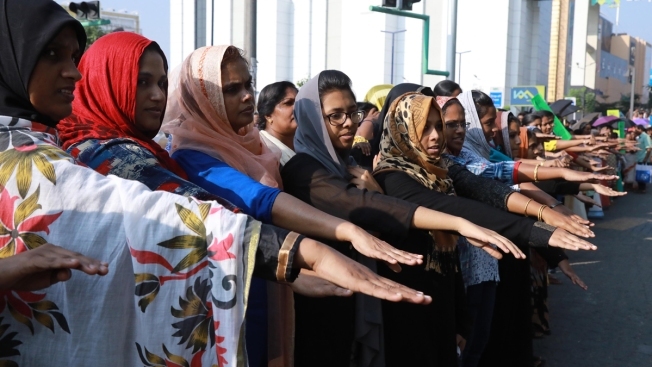 Tens of thousands of women formed a human chain across a southern Indian state in support of a court order overturning a partial ban on women entering one of Hinduism's holiest temples, witnesses said. Millions of women have formed a chain across a southern Indian state to support gender parity, amid protests by Hindu priests and conservatives against women of menstruating age worshipping at one of the world's largest Hindu pilgrimage sites. The Communist Party of India (Marxist), the ruling party in Kerala state, says Tuesday's protest drew some 5.5 million women. The protest was called by the state government after demonstrators blocked women from entering the centuries-old Sabarimala temple. The women were being blocked despite India's Supreme Court in September lifting a ban that had prevented women aged 10 to 50 from worshipping at the temple. The ban was informal for many years and became law in 1972. Kerala's chief minister, Pinarayi Vijayan, said before the event began that women were joining to save Kerala from being "dragged back into the era of darkness," according to the Times of India. Two women entered the Sabarimala temple early Wednesday morning, prompting authorities at the temple to briefly shut it for purification rituals, the newspaper reported.